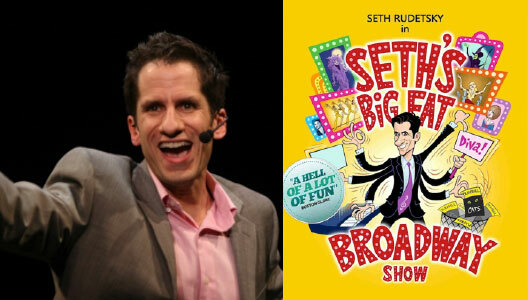 Radio host, Emmy award-winning writer and accompanist to the stars, Seth Rudetsky, brings his traveling one-man show, Seth’s Big Fat Broadway Show, to the Madison Theatre, Molloy College for one night only. Rudetsky is currently the host of “Seth’s Big Fat Broadway” on Sirius/XM Satellite Radio’s On Broadway, as well as being the host of a weekly talk show on Sirius/XM called “Seth Speaks.” With perfect comedic timing, Rudetsky, who has been a pianist and performer on dozens of Broadway shows and concerts, takes the audience on a journey to mock and deconstruct Broadway musicals, splattered with insider insights into vocalists like Cher, Madonna, Bea Arthur and Patti LuPone, all with a little history and trivia thrown in for fun. Part critique, part comedy, this manic 90-minute show has him lip syncing and dancing, lecturing and laughing to his personal audio and video collection.